At the recently held EICMA 2018, Taiwanese motorcycle maker KYMCO unveiled an electric supersport, the KYMCO Supernex. The company says that the USP of this bike is its six-speed transmission. Unlike other electric motorcycles which lose grunt after the midrange, given the nature of electric motors, this transmission allows the Supernex to provide consistent, quick acceleration by keeping the motor in its optimal powerband. The Supernex can get from 0 to 100 kmph in 2.9s, from 0 to 200 km/hr in 7.5 seconds and from 0 to 250 km/hr in 10.9 seconds. The Supernex also features a performance management system called KYMCO FEP (KYMCO Full Engagement Performance). This is a suite of rider assists like launch assists, wheelie or wheel spin control, stoppie control as well as wet mode for added traction. This system's intervention can be set to the rider's preference. The ride experience can be further altered by way of the four drive modes that the Supernex. These are Poised, Assertive, Bold and Extreme. These progressively alter the rider experience from being calm and urban-friendly to aggressive and track focused. 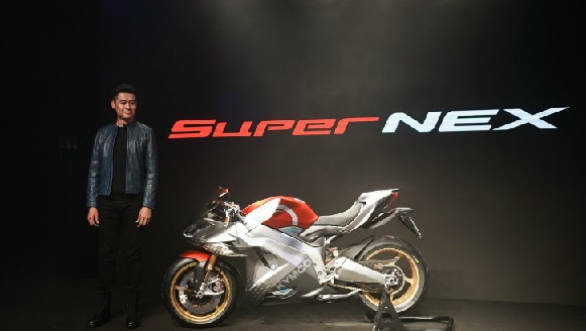 The KYMCO Supernex looks quite similar to other supersport motorcycles with the double-barrel headlamp and fairing dominating the look. It has sculpted bodywork throughout and a single high-set seat which seems to suggest a committed riding position. There are no details of when the bike launches or if it will make it to India.